As part of Carlsberg’s ambitious sustainability programme “TogetherTowardsZERO”, the company is making its products more sustainable and ensuring that consumers can live more sustainable lives. To that end, Carlsberg looked at the entire value chain to improve every part of its packaging, and that also included the ink for their beer labels. To help with that, the company chose hubergroup as the main ink supplier for their beer labels in selected markets. During an exclusive event held in Copenhagen in September, Carlsberg revealed a series of exciting innovations developed in partnership with hubergroup, and at the same time highlighted hubergroup for its great commitment to roll out better and more environmentally friendly inks in front of the gathered trade press: “Printing inks have major impacts on the recyclability of packaging because they are often recycled along with paper fibers. 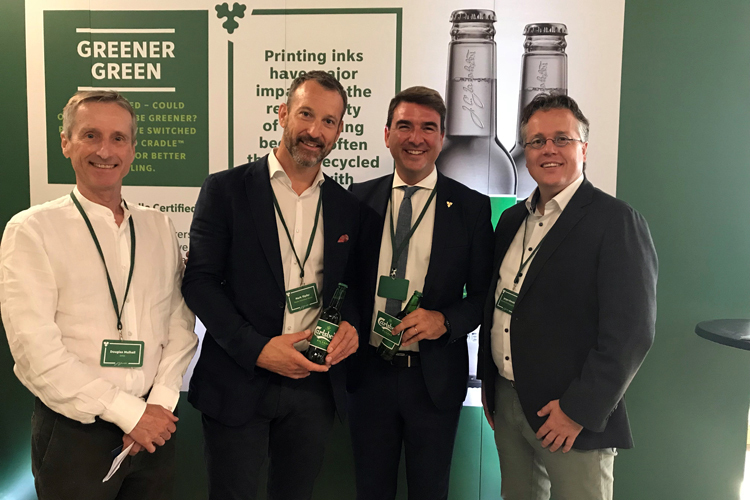 To improve the recyclability of Carlsberg labels in selected markets, we are using the hubergroup Eco-Offset Ink Premium Plus, which is Cradle to Cradle Certified™ at the Silver level,” say Carlsberg Brand Director Julian Marsili from the Carlsberg Group.